This Thornycroft was first registered to D. J. Jones in September 1927. The body maker is not known but is possibly Thomas & Thomas of Carmarthen who built many for this area’s operators. It is seen here carrying children to school in Crymmych (accepted spelling at the time) and the owner is at the wheel. Also on board are his son and daughter and a young William Stanley Rees who would later work for D. J. Jones as a mechanic and driver. Later still, Stan Rees would set up his own garage before taking over the buses operated by Edwards Bros, also of Crymmych, and eventually calling his bus company Midway Motors. Midway still operate, now in the hands of Mrs Elan Rees and her three sons (grandsons of W.S. Rees) whilst the daughter of D. J. Jones still operates school runs with an LDV Convoy. I am currently attempting to write the story of these North Pembrokeshire operators and invite any Old Bus Photos readers to input any information at their disposal! Around 1924, the War Office revived the ‘subvention’ or ‘subsidy’ scheme under which vehicles of an approved design suitable for military use would command an initial subsidy to set against the purchase price, and then an annual subsidy for three years. This, it was considered, would provide a ready fleet of suitable machines for commandeering should hostilities recommence. The Thornycroft offering was the A1 with a wheelbase of 11ft 6ins, but a stretched version called the A1 Long appeared in 1925 with a wheelbase of 14ft. Uprated versions for 2 ton loads called the A2 and A2 Long followed in 1926 This seems to be an example of the A1 Long or A2 Long, which had a side valve engine of 3.62 litres producing 36 bhp at 1500 rpm, a four speed crash gearbox and a worm drive rear axle. The source of this detail is Alan Townsin’s book on the manufacturer. How many times do we look admiringly at old photos of buses and coaches from earlier times and think "What a fine example of the coachbuilder’s craft"? Couldn’t really say that about this one in all honesty! Is it in a rut, or is that rear tyre under-inflated? Nevertheless, a really interesting photograph…I really like viewing the ancient photos of the beginnings of public transport, not just for the vehicles, but the old street scenes, and the clothing worn in those days. My father would have been 9 yrs old in 1927, and I imagine that a sight of this type of bus would have been nothing out of the ordinary. I was transported to school from Llandissilio to Narberth between 1954 / 1956 in a Sentinel just like ODE 182, I remember the sword on the front,it appealed to a ten year old. I wonder how many 1949 models like that one that Edwards of Crymych operated. Yours was probably NDE 689 Richard. It was delivered to Pritchard, Narberth in September 1951 but was sold to Edwards Bros, Crymych in June 1953. They had two of their own. Roberts (Pioneer) Newport had two, Harries, Prendergast had one. I well remember Dai John Jones as a wonderful character, his wife was a cousin of mine. Dai John drove me and my Mother to Bristol in June 1941, at the height of the blitz. He stayed for a night before driving back – we all had to sleep in an air-raid shelter. Regretfully I have lost touch with his family, Denley and Daish (not sure of the spelling there). I believe Denley emigrated and when I last enquired, Daish still lived above the garage. 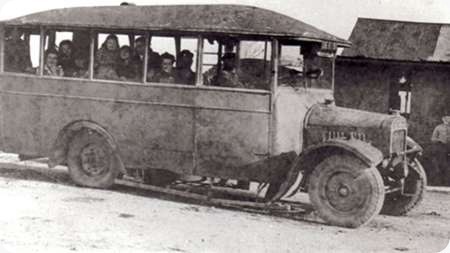 I recall Dai John’s coaches ferrying pupils to and from Cardigan county School in 1941. James Davies, I can confirm that Denley emigrated to Australia. I can confirm that his sister Decima, aka Dess or Dessie, still lives above the garage. She eventually retired in 2016 and had continued with a minibus on a school contract right up to that time. She was subject of a TV programme after 60 years of coach driving. I spent some time talking to her in preparation for a book all about the operators in Crymych & Maenclochog, a lovely lady with an excellent memory. Her coffee and scones were nice too! The DJJ story makes interesting reading and I hope that my publisher will be taking this one as soon as they finish work on my Cardigan book. Sorry to be so long getting back and thank you, Les Dickinson, for your most interesting comments. I look forward to seeing your Cardigan book. I also hope to be able to reach the area some time this year and will be making an effort to call at Crymych. It would be great to meet Dess again. James, I am currently checking and amending the proof copy and will be returning it to the publisher in the next few days. They have a little work left to do but will be sending to printers very soon. The publisher will then accept the Crymych/Maenclochog book as soon as this Cardigan one goes to print. Perhaps we might meet when you are in the area and see if you have anything to add to the book before they call it in? Peter will put you in touch with me if you think this is a good idea. Thank you again, Les Dickinson. I should be delighted to meet you when I am next in the Crymych area.